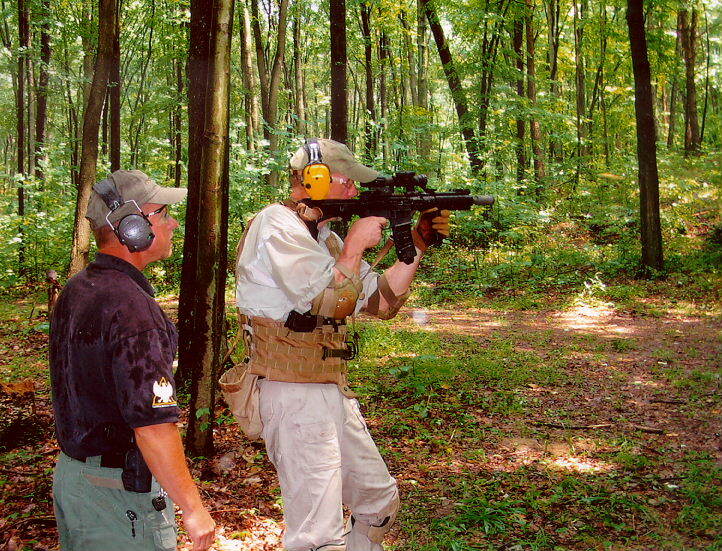 Over the last several years I've attended a number of tactical rifle courses in which the overwhelming long gun of choice was some variant of the 16" AR carbine. Only a few had 20" barrels and non-collapsible A2 stocks. 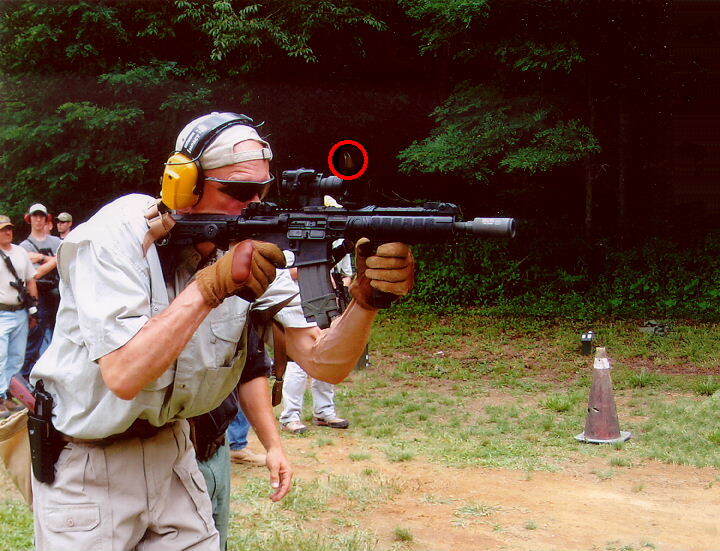 Increasingly, I noticed students and instructors who brought ARs having barrels under (some well under) 16" - in other words, short-barreled rifles (SBRs). Some were 14" and 12" guns, but a few sported 10.5" barrels. One set-up I saw was a suppressed 7" SBR. Some students were civilians, some were in law enforcement. These short guns appeared handy, shot accurately, and the ones I saw ran reliably. Though all my 16" AR carbines shoot just fine, at some point I decided I had to have my own SBR. SBRs are the subject of special regulation under federal law, along with short-barreled shotguns, suppressors, and fully-automatic weapons. These items are sometimes called "Class 3" weapons under the National Firearms Act (NFA), which is administered and enforced by the Bureau of Alcohol, Tobacco, Firearms & Explosives (BATFE). Before you can acquire any of them, there are a number of steps to go through, not the least of which is determining whether a particular Class 3/NFA item can even be lawfully owned under the law of your State and/or local jurisdiction. In the case of an SBR, assuming that your State doesn't prohibit ownership or possession, then other steps involve the completion of several documents, such as the correct BATFE application form for the item, a citizenship form, and fingerprint cards. A critical step in this process is getting a sign-off on the primary form from your locale's chief law enforcement official, typically a sheriff or police chief. You also have to pay BATFE a $200.00 tax (per item) for a tax stamp on the applicable form. 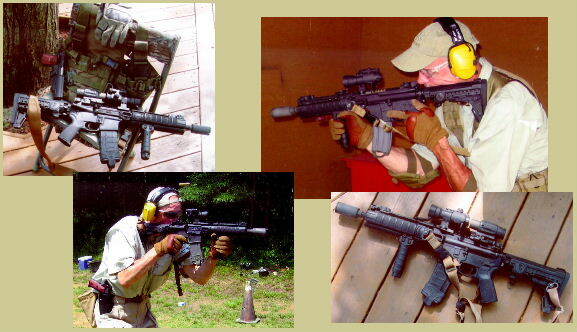 Different forms apply to different Class 3 weapons - Form 1 for SBRs, for example, and Form 4 for suppressors. After BATFE's approval, the receiver or barrel of your SBR will need to be engraved with your name, city and state. But since the main purpose of putting together my little blaster was to have FUN with it, I also had custom engraving done later (see below). LMT MRP (CQB) 10.5 KX3 - A SECRET CODE? No, not really. That's just one way of describing my SBR. I prefer to call it my "10-K" for short. On receipt of my BATFE-approved and stamped Form 1, my SBR started with a standard Bushmaster lower (the registered "gun" for NFA purposes). The upper receiver is a Lewis Machine & Tool (LMT) Monolithic Rail Platform (MRP) with integrated rails. Originally purchased with a 16" chrome-lined barrel, I've had it for several years now and love it. There's a choice of rail lengths depending on which of the two types of MRP uppers you buy: the CQB MRP or the so-called "rifle-length" MRP. Mine is the CQB upper. The top rail is 16.5" long, while the side rails are 10". The rifle-length MRP upper is longer, having a usable top rail of 20.5". The MRP receiver is a solid, rigid unit, machined from an 8-pound billet of aircraft grade aluminum. Barrel attachment is by means of two (2) torx-head bolts that, when tightened down, cause the receiver to tighten 360-degrees around the barrel. This unconventional design means that an MRP receiver can accept only MRP barrels. However, the design not only eliminates using a barrel nut and possible gaps in the barrel/receiver juncture, thereby enhancing accuracy, but it turns the MRP into a "switch barrel" upper. And the switching itself consumes only as much time as it takes the user to (a) unscrew the bolts and carefully remove one barrel and then (b) carefully slide another into the receiver and tighten the bolts again. The gas tube is straight and attaches to the barrel by a gas block. The tube is aligned with the bolt carrier key by means of a locating bridge, through which it passes into the receiver when the barrel is installed. For my SBR build, I ordered the MRP 10.5" barrel. While the original 16" barrel uses a mid-length gas tube, the 10.5 came with a carbine-length tube. It also came with a standard A2 flashhider (FH). This was promptly ditched in favor of a Noveske KX3 flash suppressor (hence the "K" in 10-K). 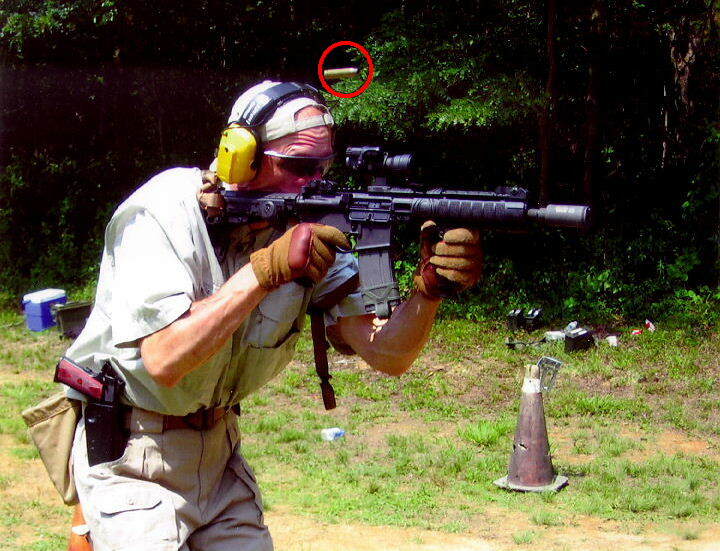 While SBRs have advantages - such as compactness in tight spaces and ease of handling - one of their more severe disadvantages is that short barrels acerbate concussive blast, noise and muzzle flash. This is an especially serious concern if firing unsuppressed inside structures or from confined quarters, such as a vehicle. 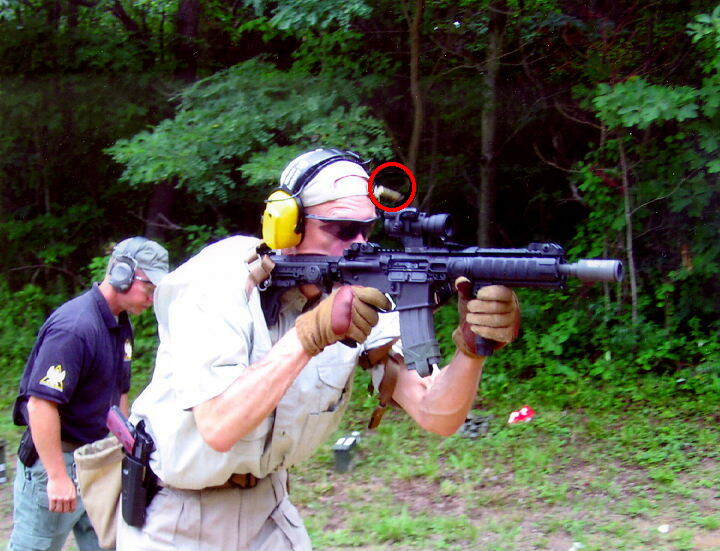 Also, even on the range, the lateral blast and noise of an SBR can be a real nuisance to those on either side of the shooter. Noveske's KX3 is similar in shape to the conical "Krink" FH frequently seen on the short-barreled Bulgarian Krinkov AKs. Dimensions are 3.2" long, 1.3" in diameter. Weight is just over 7 ounces. Each KX3 is individually serial-numbered for quality control. By design it operates to eliminate sideways blast by re-directing all that bad stuff down range away from the shooter and those nearby. During tactical classes I've actually had students next to me point at the KX3 and ask, "Is that a suppressor?" It's not - BATFE regards it as just another FH - but the blast reduction-through-redirection is so significant it fools people. To be sure, there's still a flash signature (the thing's sometimes called a "flaming pig"), and it weighs more than the typical elongated FHs, but those burdens are outweighed by its utility during trigger-time. Perhaps most important is that the KX3 improves functional reliability. SBRs can be ammo finicky (especially when using commercial .223 fodder versus 5.56 mil-spec) and not infrequently they exhibit cycling problems until certain variables have been tweaked sufficiently. Sometimes the gas system isn't set up right, depending on who built the upper. Crappy ammo and/or bad magazines aside, such variables also include using the right recoil buffer and spring weights relative to barrel length, along with the heavier, FA bolt carrier. 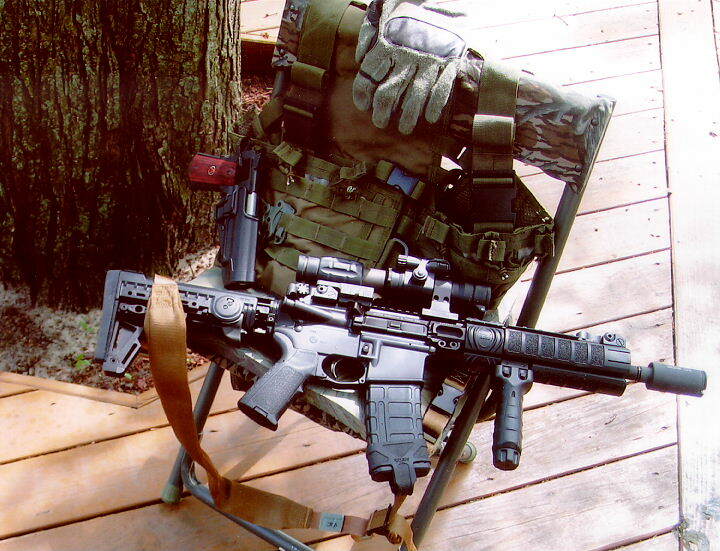 Some SBR owners report having to fiddle around trying different things before their guns run hiccup-free. Not so with mine. The internal geometry of the KX3 promotes a boost in back-pressure during the bolt-cycling phase. This operates to "trick" the gun into functioning as if it had a longer barrel. On the recoil-buffer weight, I've used both the H and H2 buffers with no problems, but the H2 seems to be optimal for a wide range of .223/5.56 ammo. Of course, that's in my gun - as always, your mileage may vary. 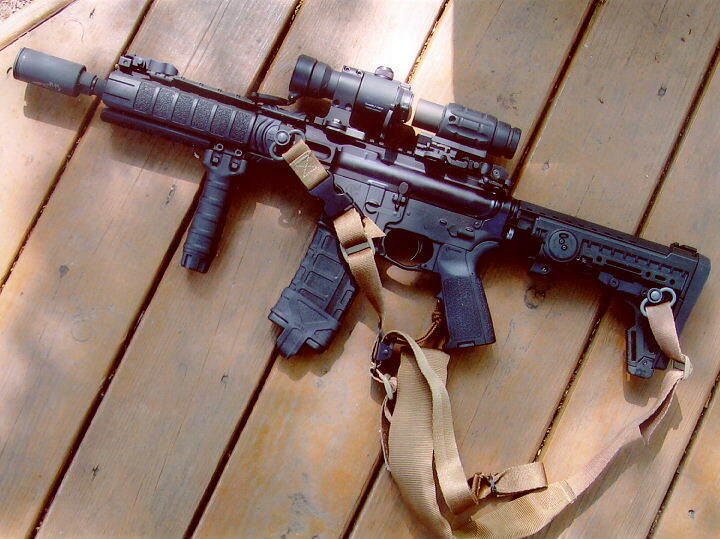 My SBR is based on a Lewis Machine & Tool MRP upper with a 10.5" barrel. A Noveske KX3 replaced the standard A2 flashhider. • Magpul M93A2 MSS Carbine Stock, w/ buttpad, reinforced brackets, QD Mount and Strike Plate. • ISMI carbine recoil spring and H2 buffer. • Magpul MIAD Grip & Enhanced Trigger Guard. • 10.5 MRP barrel with Noveske KX3 FS. • Aimpoint ML2 Red Dot in LaRue Comp M2 Mount (LT-150). • Aimpoint 3x Magnifier in Samson Quick-Flip Mount, w/ ARMS locking lever. • Troy folding front and rear BUIS (FBSAF4F & FBSB4F). 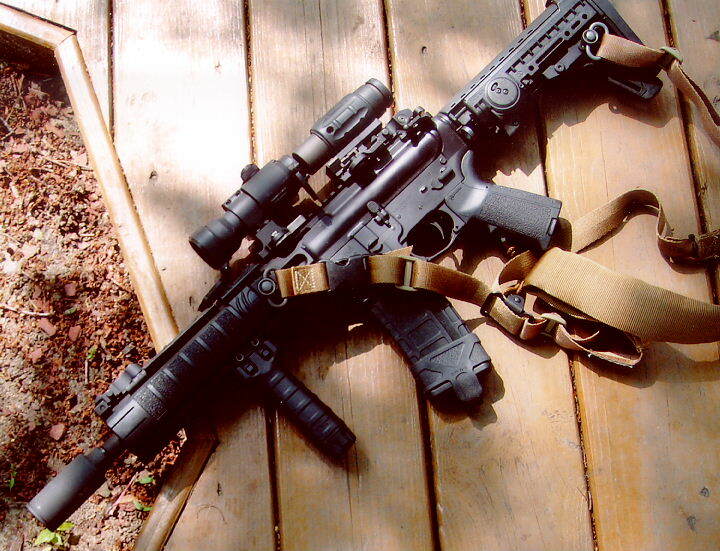 • Rail panels: combo of TD, Magpul & CCA (formerly "TDI"). • LaRue Padded Sling in QD swivels (VTAC-LR2). As noted, the NFA requires the "maker" of an SBR to have his name, city and state engraved on the gun. This can be done on the barrel, frame or receiver, per the applicable NFA regulation. For this work, as well as for the custom engraving shown above, I used Ryan Buck at Orion-Arms. Ryan was a great guy to deal with. He charges a fair price for his NFA engraving, responded promptly to my e-mails, and his turn-around time was GREAT. In my case it was about 10 days from my door to his and back again. All he needs for the work is the stripped receiver. 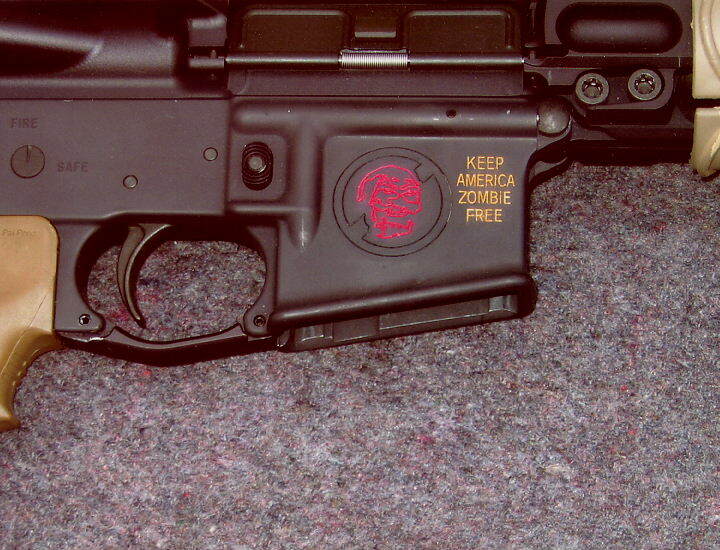 While the NFA info is required, custom engraving is, of course, optional. Since I wanted this to be a "FUN GUN," and since micro-barreled SBRs are sometimes referred to as "Zombie guns," I had Ryan do a custom piece on the release button side of the magazine well. Ryan's work was outstanding, and his website displays other types of custom engraving patterns from which to choose. OKAY, BUT HOW'S IT SHOOT? The Samurai of feudal Japan often carried a back-up sword, the shorter Wakizashi, along with the primary Katana sword. Operating together, these weapons were called the daisho. Here, my 5.56mm 10-K is backed up by a 10mm Delta Elite. Training ammo in the 10-K is generic .223 FMJ; the Delta gets Double Tap's 180gn FMJ ammo. For any real deal, the 10-K shoots heavy OTMs (75gn or 77gn), while the Delta uses a high-performance HP. SBRs are handy and, to some extent, they carry a CDI-factor. But what I've learned about my 10-K is that at least out to 300-yards it will shoot as accurately as any 16" carbine - perhaps even more accurately because that 10.5" barrel, being stiff and free floated, vibrates little, if at all. In fact, I've hit steel plates and silhouette poppers with regularity at that distance using Aimpoint's red dot and 3x magnifier. The MRP upper is very rigid and, over time, there's been no inopportune loosening of the torx bolts, so the barrel's held its zero. In my view the optics will go down well before anything on the MRP goes loosey-goosey. In addition to its accuracy and reliability, the 10-K points well and is extremely quick to put on target. There's minimal muzzle rise even in rapid fire, probably another consequence of the KX3. The MRP CQB rails, though compact, offer plenty of space for optics, BUIS and other essential gear that needs to be ON the gun. For my needs it's perfect. The 10-K has proven to be a handy little blaster in various training scenarios, as the pictures at TDI indicate. During the M&S drills, some students asked if the Noveske KX3 was a sound "suppressor." It's not, but the KX3's blast reduction-through-redirection design works very effectively. The 10-K points well, is extremely quick on target, and has virtually no muzzle rise. 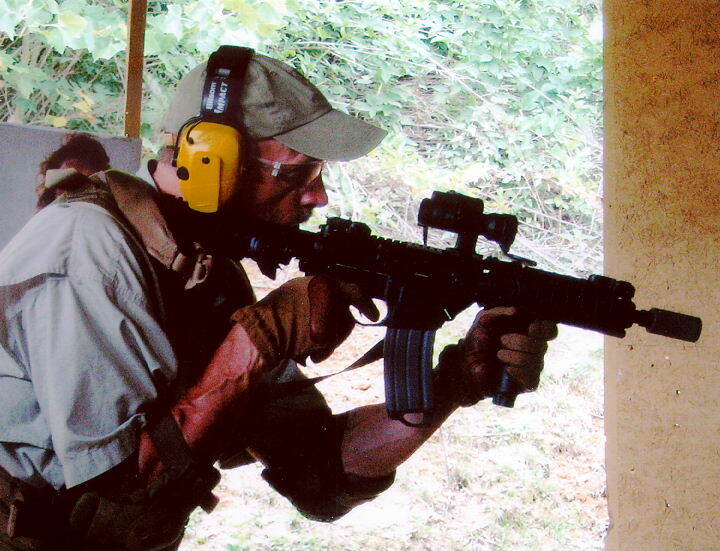 At typical CQB ranges, effective rapid-fire hits are no problem. Accuracy isn't the real concern with SBRs. 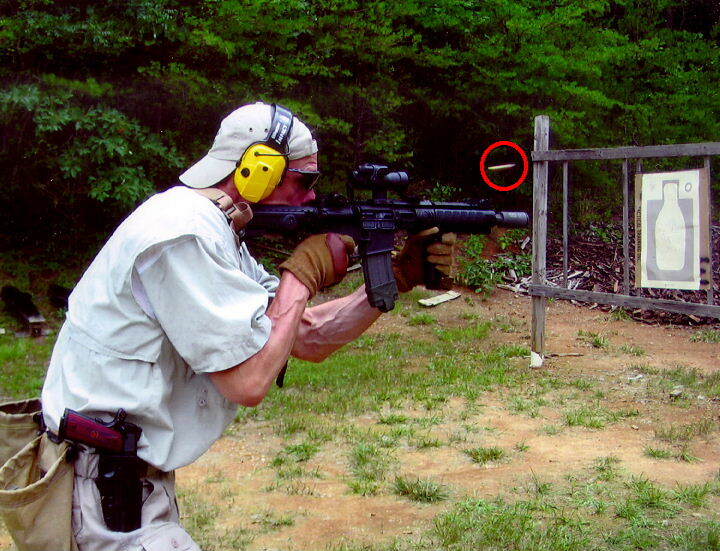 Shortening barrel-length on the AR system involves trade-offs, and the two negatives always mentioned are diminished reliability and loss of terminal velocity. In the case of the MRPs switch-barrel system, the fact that the barrel already has a properly mated and correct length gas tube stifles most reliability problems. Add the KX3, a FA bolt carrier and the right recoil buffer and spring weight for cycling, and after 3000-rounds my 10.5" MRP has run problem-free. The real problem is that short barrels sacrifice muzzle velocity in favor of easier handling and maneuverability. By consequence, reduced velocity changes the terminal ballistics of the .223/5.56mm cartridge, and thus its effective range, as compared to the 16" or longer guns. While going from 16" to 14.5" won't be that significant, dropping barrel length to 10.5" results in a substantial ballistic sacrifice of the projectile's effective fragmentation range. This is, roughly, the maximum distance at which a given 5.56mm bullet will have enough velocity to reach its "fragmentation threshold" and still retain sufficient wounding and/or incapacitation capability inside the target. That threshold is a function of several factors: barrel length, muzzle velocity, and the projectile's design and weight (i.e., 55gn FMJ vs. 77gn OTM). Given the significant velocity reduction expected from a 10.5" barrel, a 5.56mm bullet will exhibit diminished wounding capability beyond a certain distance. 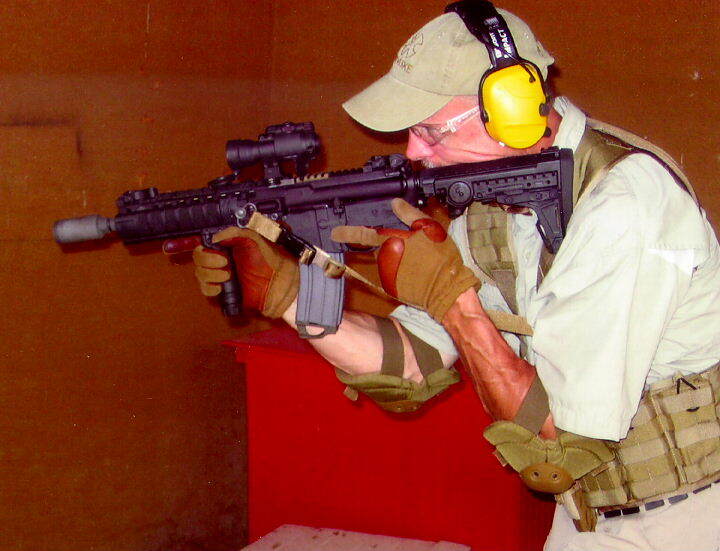 Not a good thing in an SBR meant for fighting, unless you're prepared to accept its limitations and work within them. A 10-inch SBR can shine during building-search scenarios, where its compactness aids in safely maneuvering narrow hallways and "pieing" into rooms. 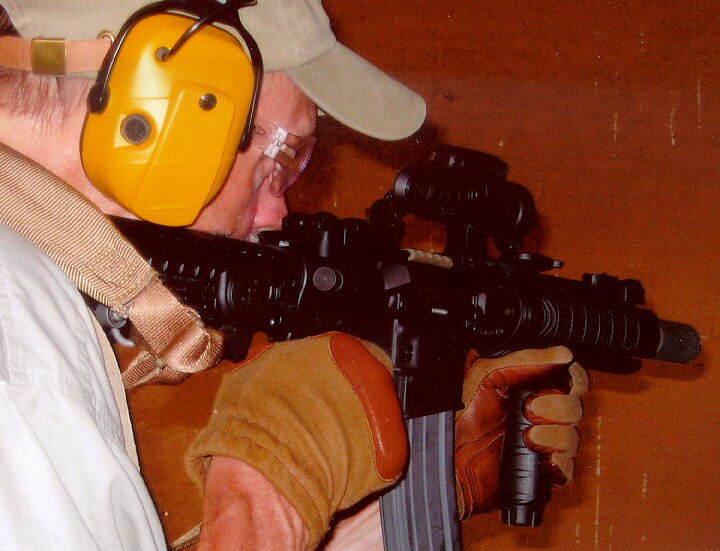 While handy indoors, an SBR isn't a substitute for a skill-set. Shadowy halls and suspicious doorways still require alertness and solid approach & clearing techniques in order to detect threats. During advanced tactical rifle training at Tactical Defense Institute, I found the 10-K to be especially handy for certain realistic scenarios, such as engaging bad guys inside the rooms and hallways of the Live Fire Houses. It also performed well on TDI's Jungle Trail. Detecting well-camouflaged "hostiles" is the difficult part there, but the shots generally are not over 100yds. 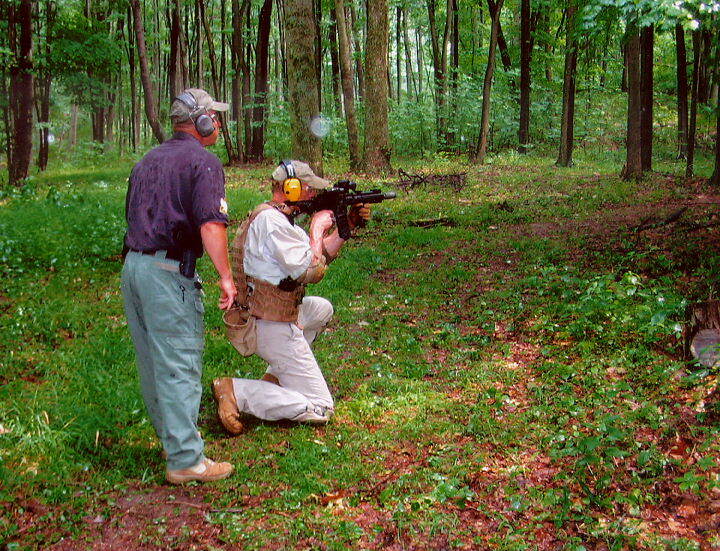 Detecting camouflaged bad guys along the trail can be more difficult than the actual shot itself once you find them. Ranges are generally under 100yds. Senior TDI Instructor John Motil observes as I take out a target about 50yds away and up on a hillside. Last target was a steel silhouette placed behind a log, about 80yds away. That's still within the weapon's effective range. The 10-K carried easy and was quick to shoulder. 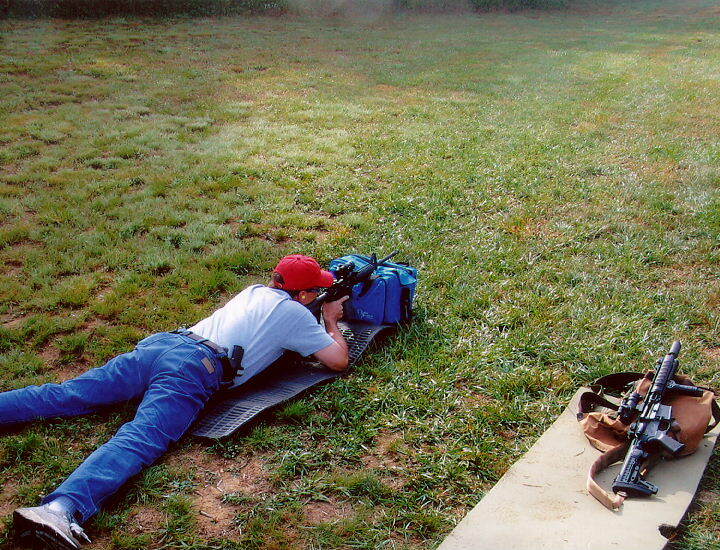 TDI student with 16" AR (left) shoots prone from 200yds. My 10-K is on the right. Later we hit steel plates at 300yds. While still accurate, a 10" barrel sacrifices a lot of muzzle velocity and effective range for ease of handling. Bottom-line: for any practical defensive use, my 10-K is a 125 yards-and-in weapon. 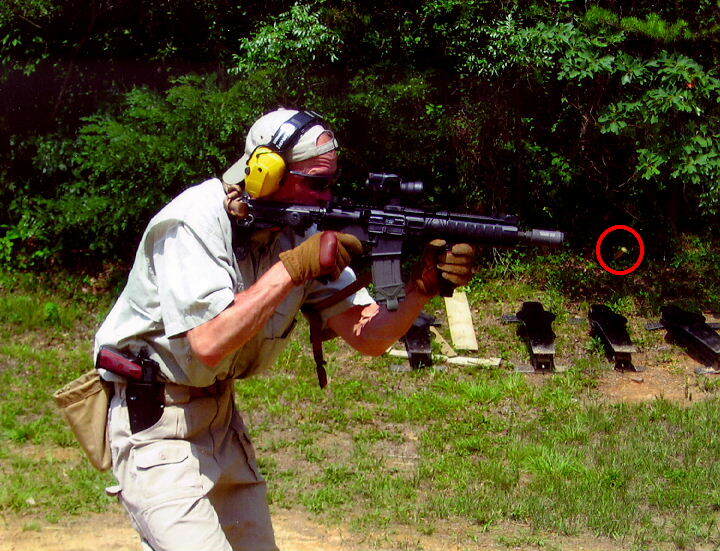 And that range is also predicated on two other factors: first, that when engaging targets I'm using well-practiced shooting techniques to generate multiple focused hits (i.e., double-taps, triple-taps or "hammers"); and, second, that the ammo fired is the most effective available for these micro-barrel ARs - specifically the heavier OTM/HP rounds, whether military or commercial issue. Not surprisingly, the MRP's 1-7 twist C/L barrel prefers the heavier match-type HP bullets, but still shoots the ubiquitous 55gn FMJ bullet decently too, certainly well within "combat accuracy." In fact, for training ammo, I shoot whatever FMJ blasting stuff I can find these days and call it good. If it's cheap, that's even better, because the money saved on ammo goes for training, and there's no such thing as "too much" training. Sure, a 10" SBR can be configured to look like a space gun from the "Aliens" movies, but back in the real world it's still a ballistically-challenged .22-caliber weapon. It's got nothing on Mr. Spock's Phaser.